Role-play activities are a fun way for students to practice vital speaking skills. Give students some masks and assign them characters to play and they can "be" someone else while practicing their speaking skills. These activities are particularly ideal for children and teenagers. In many cases, they can also help shy students come out of their shells. The biggest part of getting role-play activities to run successfully is selling them to your students. Role-play is a dramatic activity, and for some learners it might not be something they are comfortable with. However, if you sell the activity successfully, you can get most, if not all, students on board. Say This: Being able to speak and use English creatively is a cornerstone of learning a language. You must be able to create dialogue and deliver a message effectively. 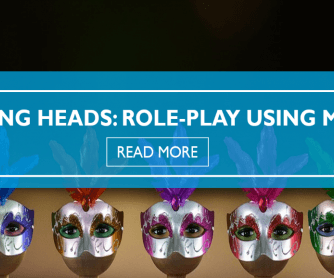 Think This: Don’t shy away from role-play! Show your students some interesting role-play scenes from YouTube. There are lots of classrooms like yours that have recorded and posted videos of role-play activities. Put students into groups of three and give them a set of the masks. You can find masks to print online. It’s also easy to make your own masks with faces that your students might be more familiar with. Simply Google the name of the person with ‘cut out mask’ written after the name. For example, if you wanted a Donald Trump mask, you’d type ‘Donald Trump cut out mask’. Copy and paste the image into Word and resize it to fit the whole page. Look for a range of different characters including Spiderman, the Queen of England, and Simon Cowell. Ask students to cut the masks out. If you want the masks to be more durable, you can laminate them or have students glue them to pieces of cardboard or cardstock. Tell your students they are going to have some time to create a dialogue. Then, they are going to hold the masks in front of their faces and speak as if they are the people depicted on their masks. Students can use all of the masks in a set, changing characters throughout the conversation, or they can stick with the same characters throughout the entire conversation. Students can talk about any subject they want as long as it’s not rude or offensive. There needs to be a starting point to the conversation. Where are the characters? In the forest? At home? Sitting on the beach? What are they characters doing? Arguing? Eating lunch? Going on a holiday? Ask students to share some ideas and write these on the board. Students may refer to them later when they begin writing their own role-play dialogues. Conflict helps make the dialogue more interesting. There needs to be something that the characters have to come up against. This could be against each other, another person, or even themselves. What problem do they have to solve? Do they have a problem with each other or something else? Again, ask students to share some ideas and write them on the board. Finally, there has to be a resolution. Any conflicts need to be completed and solutions must be found to all the problems. Once you've given students the components of a dialogue, they can begin working on their own. Give students time to write down the things they want the characters to say and discuss the storyline with each other. Students might need space and time to do this. Just make sure you are on hand to support them in the process. If groups have trouble coming up with creative ideas, offer any ideas you can and encourage them to look at the things you wrote on the board earlier. Get students to practice their dialogue a few times with each other so they can iron out any problems. Continue to circulate while they do this, offering suggestions, and possibly corrections, to their English. Remember to praise students as well so they will be more motivated to do a better job. Once students have written their dialogues, ask them to perform them for the rest of the class. Ask students to listen out for linguistic features, such as the pronunciation, the grammatical accuracy, the vocabulary used, or the content of the dialogue itself. When you give feedback to the students after they have finished, you can also comment on these things. Whatever feedback you give, remember to make your comments more positive than negative to help keep students from feeling discouraged in the language learning process. During the process, you can video students performing their dialogues. Videos are great for them to review and can also be uploaded to YouTube to help other language learners. For more role-play ideas, check out some of the resources available on BusyTeacher.